Children and adults take off for the fun run. Race proceeds and donations will help buy safer playground equipment for the Dixon Child Care Center. 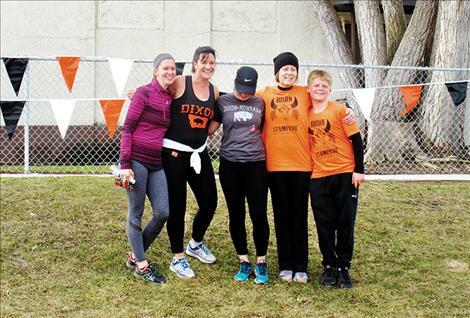 DIXON – Some ran, some cheered, some rode in strollers, and some just ate pancakes at the fifth annual Bison Stampede run in Dixon. 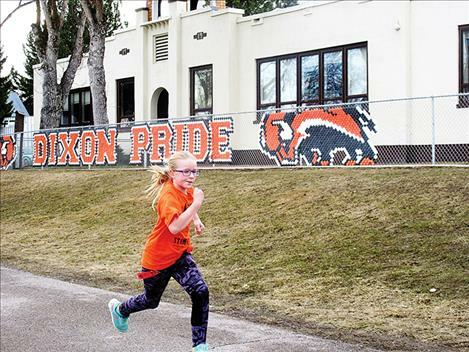 Dixon Principal Crista Anderson said this year’s race supports the purchase of new play equipment for the school’s daycare students. The new equipment will be safer and sturdier than the play structures in place today. In addition to raising money, the event gives people a reason to spend time in Dixon on the weekend, Anderson said. 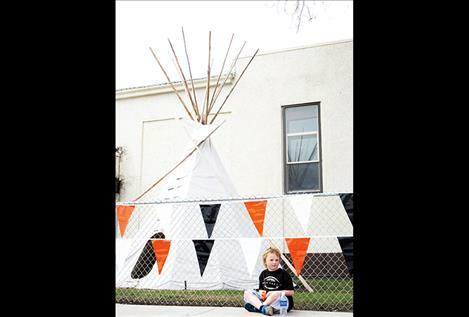 “It brings people into our community,” she said. 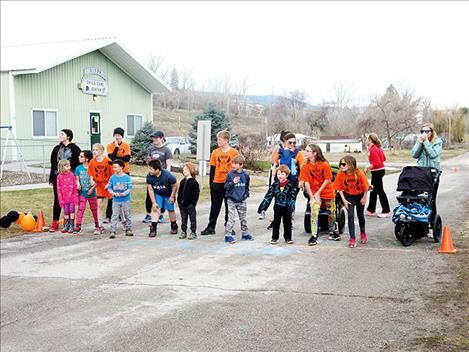 Along with funds raised from race entry fees, the school received donations from several local banks and Blackfoot Telecommunications. The equipment will cost a total of $7,000. 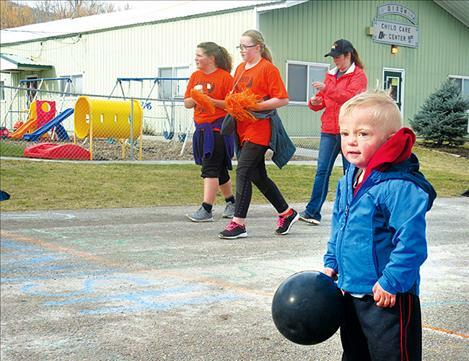 The Bison Stampede offered a full morning of activities. There was a 10K race, a 5K race and a fun run. A pancake breakfast was served inside the school. Mikey Church, a former teacher at the Dixon school district, placed second in the 10K. Then he returned to the racecourse and ran the 5K. 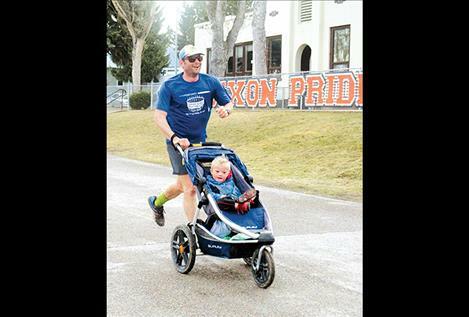 In his second race, he pushed his 3-year-old son, Rio, in a stroller. He said he attended the event to engage with the Dixon community. 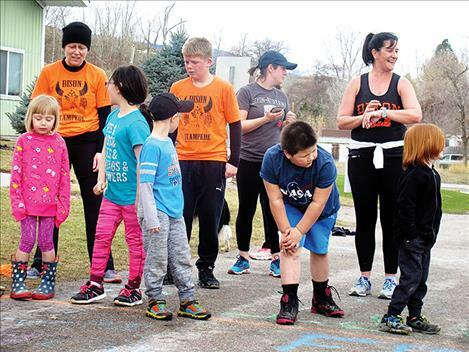 He added that the event provided an opportunity for students and families to have fun while exercising. Sixth grader Charlie Alana Elverud won the 10K overall. 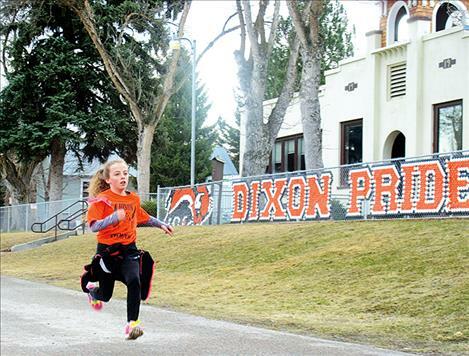 Elverud is a member of the Dixon track team where she specializes in long-distance races. The 10K is the longest distance she’s raced to date. Her time at this year’s race bested her performance from two years ago by 12 minutes. 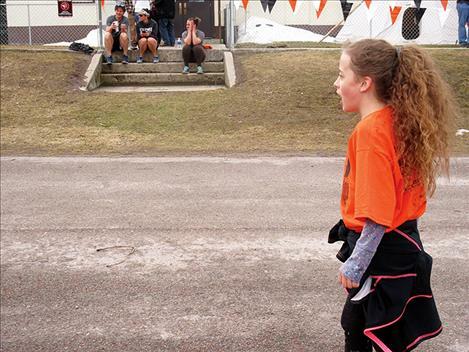 “I like running because it means I’m good at something,” she said. One student said she felt her participation had a direct impact on the school. “It’s really cool. It’s helping our little brothers,” she said. Her younger brother will attend the school’s daycare. 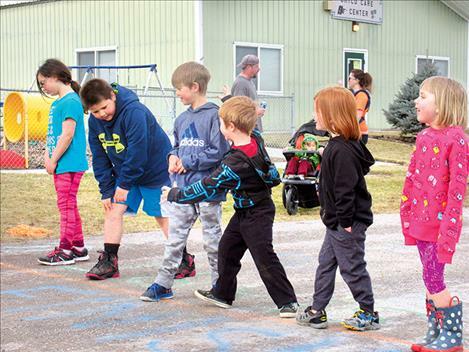 Teachers, students and community members helped execute the event. The school had a community clean up to remove trash from the race route. 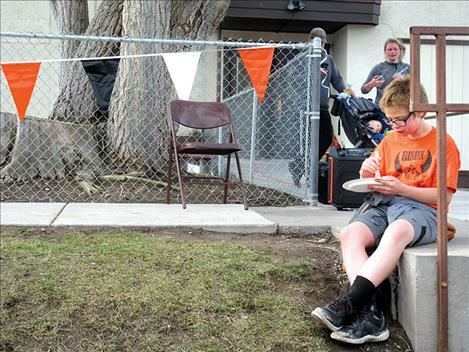 The Dixon track team, decked out in orange Bison Stampede T-shirts, set up the event and cleaned up afterward. Results of the races: In the 10K female ages 18 and under, Charlie Elverud, 48:55, took first place. For the 10K female ages 18 and up, first place went to Leigh Kenning, 55:51. Second place was Pat Bristo, 1:07:33, and third place was Liz Bassler, 1:09:35. In the 10K male ages 18 and up, first place was Mikey Church, 48:57, second place was Robert Kenning, 55:51, and third place was Matthew Marrinan, 1:26:32. For the 5K female ages 18 and under, first place was Dylann Elverud, 29:33, second place was Jayna Hale, 30:06, and third place was Katie Porter, 34:04. In the 5K female ages 18 and up, first place went to Megan Williams, 30:57, second place was Shawna Olsen 34:21 and third place Caitlin Webb, 34:59. The 5K male ages 18 and under winners included first place finisher Derek Walker, 33:33, and second place was Mark Ioli, 34:14. For the 5K male ages 18 and up, first place was Paul Soukup, 31:01, second place was Bruce Genzel, 31:28, and third place was Daniel Johnson, 39:22.